Earth-crossing asteroids - Solar System Planets And Moons Section. Earth-crossing asteroids have revised the scale. Testing new technologies in space. When it comes to using advanced technology, NASA sometimes faces a self-defeating loop: they can't take the risk of flying new technology in space unless it's already flown successfully in space. The New Millennium Program circumvents that loop by testing and validating the performance of leading-edge technologies in space so that they can be used in future operational science missions. Examples of upcoming New Millennium missions include advanced solar arrays, fault-tolerant high speed computers, a Nanosat (microsatellite) constellation, and perhaps, a solar sail. Torino scale has to be revised. Astronomers searching for potentially destructive Earth-crossing asteroids have revised the scale they use to communicate the risk of impact to the public. 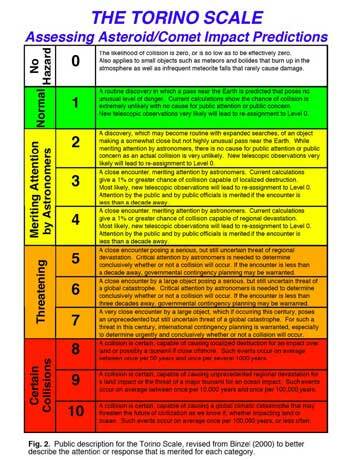 The Torino scale, which still goes from 0 (no chance of impact) to 10 (collision is certain) has the same classifications, but it's been rewritten to give the public a better idea of the risks associated with different space rocks. Instead of "meriting concern", lower risk objects now "merit attention by astronomers", explaining that Astronomers will be making further observations. Sedna has remained untouched for millions of years. Most objects in the solar system have been resurfaced by collisions with asteroids, smaller rocks and comets. But Sedna, on the other hand, has spent its lifetime in the remote reaches of the Solar System, and probably hasn't had many impacts at all. It's only been weathered by cosmic rays and solar ultraviolet radiation. Astronomers think that Sedna started out icy, like Pluto and Charon, but was then baked for millennia, until the ice was transformed into a complex hydrocarbon similar to asphalt.